Leoni has extended its range of FieldLink products with an extremely flexible 10 Gbit industrial Ethernet cable. It performs up to 5 million torsion cycles and as an easy-to-strip variant furthermore facilitates rapid assembly in the field. The cable also fulfils all the stipulations of the PROFINET Type C 4 pair standard. 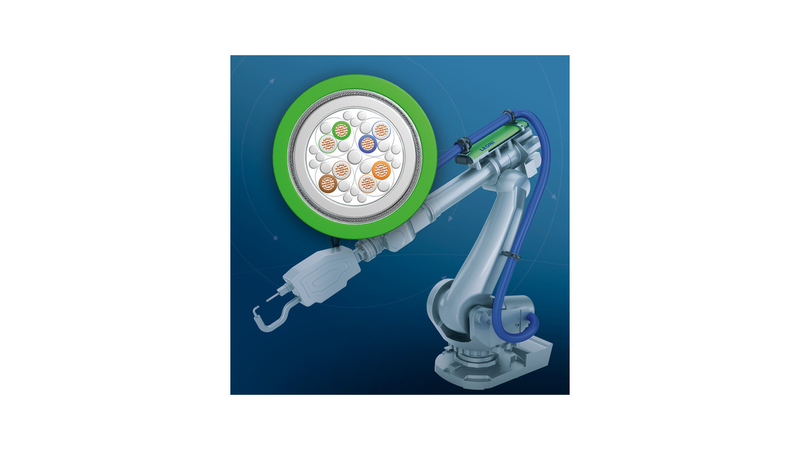 Industrial robots require intelligent and innovative cabling solutions, which ensure secure and fast data supply under the severest mechanical strains. To meet this demand, Leoni develops and produces torsion-resistant, high-flex cables that fulfil extreme requirements in terms of mechanical, chemical and thermal durability. Leonis new PROFINET solution within its FieldLink line was put through its paces at the companys in-house test centre; it withstands five million torsion cycles at torsion of 180° across one metre and is therefore ideally suited for applications where everyday operation involves extreme flex stress. The halogen-free outer jacket made of highly elastic polyurethane (PUR), which stands out not only with its resistance to abrasion, but also protects against grease, oil and lubricants, is ideal for high-flex performance. Thanks to flame-retardant additives, the jacket also fulfils the IEC 60332-1-2 fire protection requirements. The cable furthermore has UL Style 21198 approval. All four pairs are wrapped with fleece foil, and filling compounds give the cable additional stability. The highest EMC separation class is achieved by means of the optimised overall shielding with 98% coverage. The new variant is furthermore extremely easy to strip (ES) and thereby provides for rapid assembly in the field.